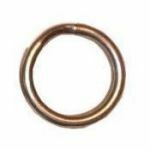 These stainless steel split rings are manufactured by Rosco Products right here in America from high quality stainless steel. They are very popular for attaching hooks to lures along with many other uses. See chart for size and approximate test ratings. 2H 30 lbs. 0.032" 0.247" 0.184"
3 25 lbs. 0.032" 0.271" 0.210"
3H 65 lbs. 0.039" 0.290" 0.205"
4H 80 lbs. 0.043" 0.325" 0.219"
5.5H 100 lbs. 0.047" 0.388" 0.274"
6XH 125 lbs. 0.055" 0.410" 0.295"
8 120 lbs. 0.055" 0.520" 0.397"